Committed to the Chief Engineer ownership, I am currently in the midst of developing a vision and common language (protocol) for the Lean New Global Architecture (LNGA) in the LGN network. As developed at Toyota, the position of Chief Engineer provides me with my basic reference point. I first heard Jim Morgan’s declaration, “Takes a lot of conflicts to create a good product!” from the Chief Engineers at Toyota, for whom it serves as a motto. Morgan had researched product development at Toyota1 and even experienced the Chief Engineer system when he worked as an executive at Ford. He explains that the Chief Engineer works in a space between the permanent fixed and the flexible by maintaining a dual loyalty: to existing standards and to innovation, which by its nature seeks to disrupt the existing situation as part of a journey towards constant improvement. 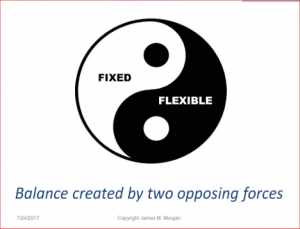 The “Ying and Yang” (Confucianism) drawing that presents harmony within a dialectic position, or the contrasts that create a whole, is also valid as a description of the balance between the maintenance of standards and change, between stability and agility, as can be seen in this illustration created by Morgan. In Western culture, and, to my best knowledge, in the East as well, concepts such as “stability” or “consensus” carry a positive connotation that refers to the preservation of a conservative stable social or other type of system; in contrast, “conflict” or “disruption” carry a negative connotation that refers to a threat to the existing order. The Chief Engineer must bridge tension between what is stable and what is changing while casting conflict into the heart of the consensus. He does not operate in an isolated office or outside of the framework; he is in the eye of the storm, deep within the organizational density. 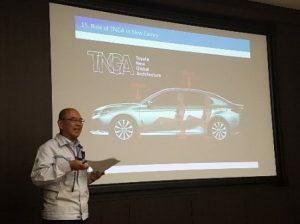 Masato Katsumata, the Chief Engineer Toyota’s group of intermediate vehicles, does not see any contradiction between his loyalty to the TNGA communications protocol and the quest for innovation and disruption. A stable organizational base and common work language between the company’s units and its suppliers create a network that allows for resources and knowledge (the stability) to combine with flexibility and innovative development in all aspects of the vehicle: quality, drivers’ experience, and the pace of the development and manufacture of a new product. Inability to engage (harness and not merely convince) the units and the suppliers (in our case, the LGN institutes) to change the current situation and achieve the vision. I have reached a point of “chicken and egg”: Since I wish to examine the operation of the system through live experimentation, together with a global company that is in the midst of an LPPD Transformation, I must deal with a practical problem: How can I engage the LGN resources in the experimentation? How is it possible to engage the lead team in the various Lean Institutes, with their varied work cultures and knowledge, when we have no agreed-upon standard or LPPD direction? How will it be possible to present a preliminary Minimum Viable Product without increasing the confusion? At Toyota, I remind myself, the Chief Engineer is evaluated according to his ability to anchor the vision at the right level above the existing situation, to maintain constant tension through experimentation and learning, gradually moving the hand that holds the current situation towards the vision – and always within the boundaries of the game. Bringing the hands closer is always a temporary situation; the test is to raise the hand of the vision up to a new stage. I repeat to myself: Growth-producing contradictions form the basis of an excellent product.